Suitable as an emergency response unit or for continuous unmanned operation. Recovery of a wide spectrum of oils, from light benzene’s to heavy oil and emulsions. For operation in API interceptors, pits, deep sumps, and situations where access is limited. The mop skimmer is also designed to operate in the presence of light debris. It can be used in confined spaces, and where a high lift is required. By the use of tethered floating pulleys, large areas can be covered. Used in conjunction with our oil on water detector, operation is automatic. A recovery rate of 4 tonnes per hour is typical, dependent on factors such as viscosity, rope swept area, oil etc. 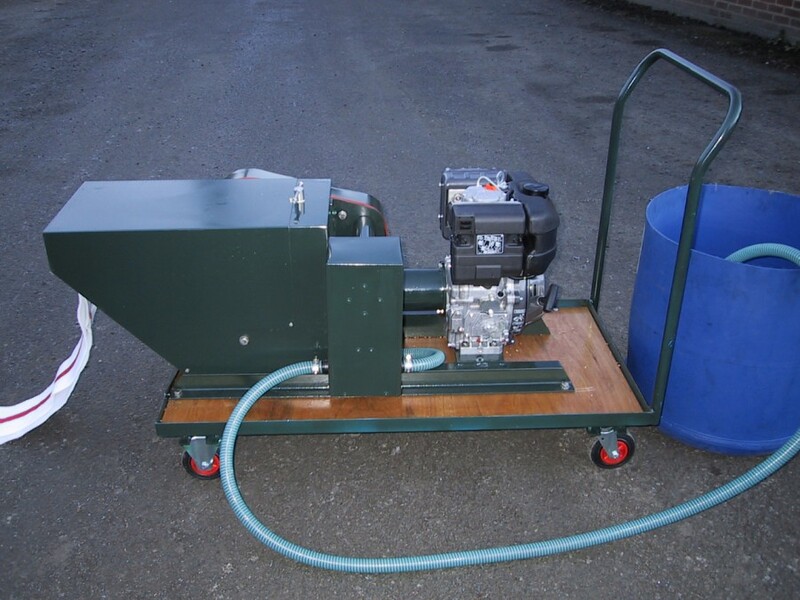 The mop skimmer uses a continuous loop of Oilsorb-Ultra rope. This unique feature ensures that far more oil is picked up, and that the life of the belt is greater. As the rope mop is a flat band rather than a bulky rope, and as it has a flat join, wear to the roller bearings is also minimal compared to a knotted join with standard ropes. Drive rollers draw the rope mop and also squeeze the oil pollutant as it passes through. The roller pressure is adjustable to allow for site conditions. The recovered oil drains into an integral separator tank or direct into the discharge outlet. The separator tank option provides two simple weir separations of the oil and water in order that the small quantity of water can drain back to source, and the oil drain to storage or disposal. Durable non-stretch oleophilic high density 150mm width polypropylene Oilsorb-Ultra rope mop, with sewn reinforced centre seam. Permanent sewn or Velcro loop closure options available. No tools required for rope mope fitting. Adjustable extended outrigger with polypropylene guide roller, 316 stainless steel frame and PTFE bearings. Drive and driven rollers manufactured from nitrile coated steel running at 16 rpm to give long maintenance free life. Heavy duty long life bearings. Pressure spring on driven roller. Residual current trip (240v model). Spark arrestor available (diesel model). Drive variants: Electric 110, 240 & 415 volt, TEFV, EExd, hydraulic, pneumatic, petrol and diesel. Static units for permanent installations. Single and double mop drive units. Oil / Water storage / separator tanks with bottom water weir and top oil weir. Floating guide rollers, single, double, floating and fixed.